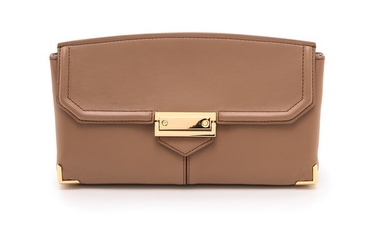 I'm not sure why this is called the Prisma Skeletal clutch as there's really nothing skeletal about it. To me, the sleek angles, gold plated corners and discreet lines of this clutch all say sophisticated, elegant and artistic. Made with durable cowhide and at just the right size to hold your daily essentials, this clutch is perfect for your weekend lunches with the girls, discreet enough to bring to the office and dressy enough to wear to an event. Make it yours via Shopbop for $584.39. Club Monaco Debuts Higher-end "Collection"